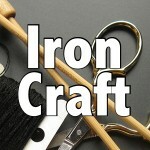 This Iron Craft challenge was about using things you already had in your stash. This was good timing for me because I needed to sewing up some items for my sister reusing an old duvet cover and cushion cover. She wanted me to turn them into an ottoman slipcover and large throw pillow. The throw pillow was easy, I just cut the appropriate sized pieces from the duvet cover to fit a large pillow insert I had bought awhile back. 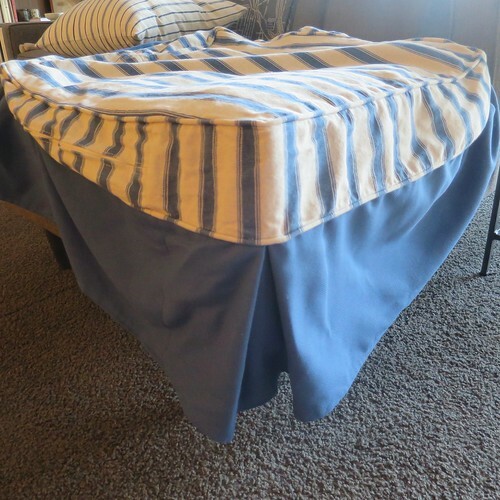 I made it even easier and used one of the seams from the duvet as a seam on the pillow, so I only had to sew three. The ottoman slipcover was a little trickier. She had given me the old slipcover to use as a guide and a cushion cover that was the exact size to fit the top of the ottoman. I while back, I had even bought the blue coordination fabric to go with it, but everything sat in my craft room. 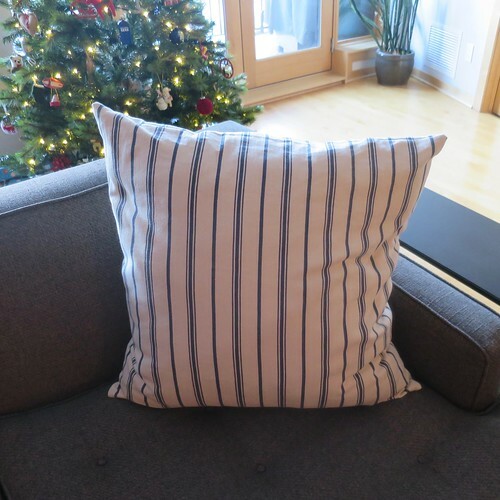 First I used a seam ripper to remove the bottom of the cushion cover. This let me see what I had to work with. Then I cut lengths of the blue fabric for the skirt until I had enough to go around the whole cushion, plus 12 inches extra for each corner box pleat. I seamed those lengths together and hemmed them all to the right length plus the seam allowance to sew it on. Sewing it on was a bit tricky as I had to make sure to get right up to the edge of the piping to make sure to catch it too. Luckily, I had the right foot for my sewing machine to do it! Also I’d never done box pleats before, but they were easier than I expected. I think this project turned out pretty good and I’m happy with the way it reused the fabric my sister had. 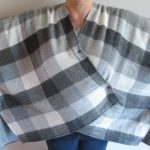 2 years ago by Kat in Challenges , Iron Craft , Needlecraft , Sewing | You can follow any responses to this entry through the RSS feed. You can leave a response, or trackback from your own site. How lucky to have a sister as kind and talented as you. This is such a great project and I certainly do appreciate upcycling things in this throwaway world. Props to everyone concerned and it turned out great. Sending you and yours wishes for the merriest of Christmases and glad tidings for a wonderful 2017.